The vast majority of injections done for the diagnosis or treatment of chronic pain are performed on an outpatient basis. Some are performed on inpatients, who may be already hospitalized for other reasons. All of them may be performed under fluoroscopic (x-ray) guidance but are sometime performed in the office without x-ray. For any nerve block, you need to tell your doctor if you are allergic to contrast dye or if you think you may be pregnant. Below is a brief description of some of the more commonly performed nerve blocks by pain management specialists. 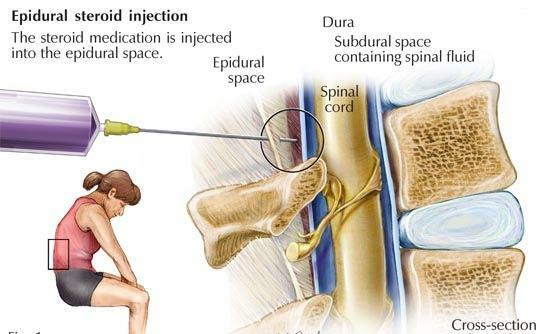 Epidural steroid injection is an injection performed in the back or neck in an attempt to place some anti-inflammatory steroid with or without a local anesthetic into the epidural space close to the inflamed area that is causing the pain. These injections are generally done for pain involving the back and leg or the neck and arm/hand. They may be done under x-ray guidance. Common side effects include soreness of the back or neck at the point where the needle enters the skin, there may be some temporary numbness in the involved extremity but persistent numbness or weakness (lasting over 8 hours) should be reported to your doctor. Epidural steroid injections may be placed in the lumbar (low back), thoracic (mid back), or cervical (neck) regions. The facet joints assist with movement of the spine both in the neck and back. Injection into these joints can provide relief of neck and back pain; these injections are always performed under x-ray guidance. Common side effects include soreness in the neck or back when the needle was inserted. 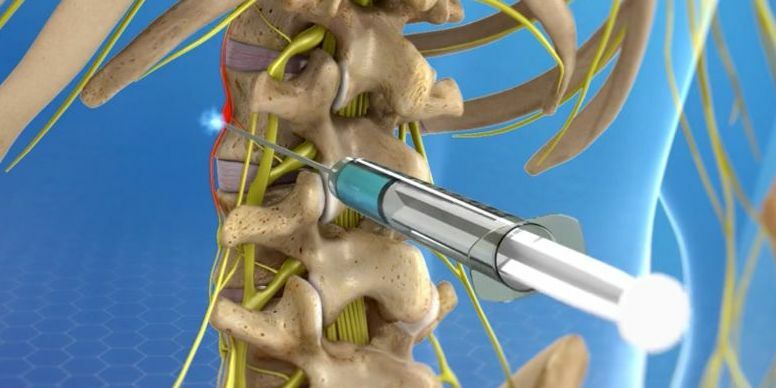 You will be on your stomach for this injection if it is done for back pain; however you may either be on your stomach or back if the injection is performed for neck pain, depending on the preference of the physician. A needle is placed in your neck or back and advanced to the level of the joint under x-ray visualization. Contrast dye is used if the needle is put within the joint, and sometimes used if the injection is designed to numb the nerves to the joint. 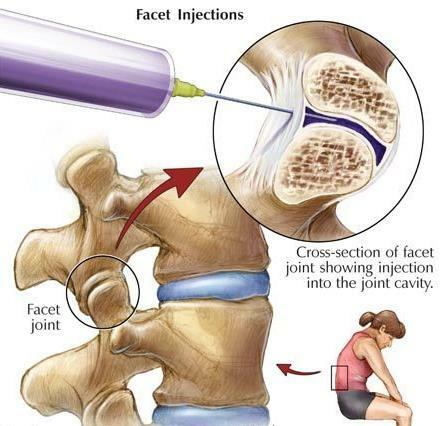 This block is often a diagnostic block and a more long lasting injection may be indicated if you have significant pain relief from this injection. A lumbar sympathetic nerve block is performed for pain in the leg that is thought to be caused by complex regional pain syndrome type I (or CRPS I). These injections are often performed under fluoroscopic (x-ray) guidance. Local anesthetic is placed near to the lumbar sympathetic chain in order to relieve the pain. Your leg will likely become warm immediately following the injection: this is an expected effect and not a complication. Back soreness is one of the more common side effects. If you feel any sharp pains down your leg or to your groin during the injection, you should let the physician know immediately. There may be some temporary numbness following the injection but if there is persistent numbness or weakness (> 8 hours) the doctor should be notified. You will be lying on your stomach for this injection. The injection is done from the back, in the lower aspect of the back. A needle is placed, often under x-ray guidance, to a spot just to the side and approaching the front part of the spine where the ganglion is located. If it is done under x-ray, a small amount of dye is injected to make sure the needle is in the right spot. After the doctor is satisfied that the contrast dye is in the right place, they will inject numbing medicine then remove the needle. Celiac Plexus Block: A celiac plexus block is generally performed to relieve pain in patients with cancer of the pancreas or other chronic abdominal pains. 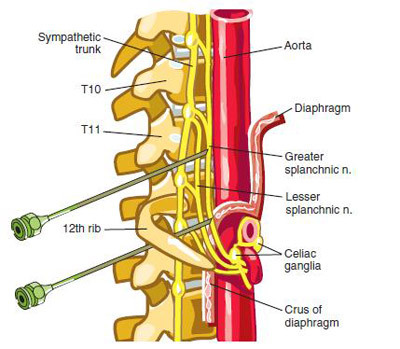 A needle is placed via your back that deposits numbing medicine to the area of a group of nerves called the celiac plexus. This injection is often performed as a diagnostic injection to see whether a more permanent injection may help with the pain. If it provides significant pain relief then the more long lasting injection may be done. This injection is usually performed under x-ray guidance. You will be lying on your stomach for this injection. The needle is place via the mid back and placed just in front of the spine. Contrast dye is injected to confirm that the needle is in the right spot; followed by some numbing medicine. Stellate Ganglion Block: A stellate ganglion block is an injection that can be performed for the diagnosis of complex regional pain syndrome of the arm or hand or for treatment of pain to that area. It can also be used to help to improve blood flow to the hand or arm in certain conditions that result in poor circulation of the hand. Side effects may include soreness in the neck where the needle was placed. In some instances the side effects may include droopiness of your eyelid on the side that is injected, along with a temporarily stuffy nose and sometimes temporary difficulty in swallowing. This injection is performed with or without x-ray guidance. You will be lying on your back for this injection with your mouth slightly open. It is very helpful to the doctor if you try not to swallow during the injection. If this injection is performed under x-ray the doctor will first inject a small amount of contrast to confirm the placement of the needle then inject some numbing medicine.